Harajuku girl in denim on denim fashion with sweatshirt, denim jacket, pink denim pants and casual shoes. Japanese photographer Mika Ninagawa releases a new fashion collection with the Japanese sportswear brand Onitsuka Tiger. Pictures of the world’s first Jeffrey Campbell boutique, located in the famous LaForet Harajuku department store in Tokyo, Japan. 18-year-old girl in resale t-shirt with retro logos paired with short checkerboard skirt. Bunka Fashion College student in flowered Grimoire Almadel dress carrying vintage Grimoire tapestry bag. Friendly girl in Snidel tiered skirt and thigh high stockings with friend in HellcatPunk shirt and tattoo tights. Cute girl with ombre hair and flowered chintz dress with friend in fringed t-shirt and polka dot pants. 18-year-old student wearing Harajuku negligee fashion featuring pink chiffon robe, seamed stockings & lacey bloomers. 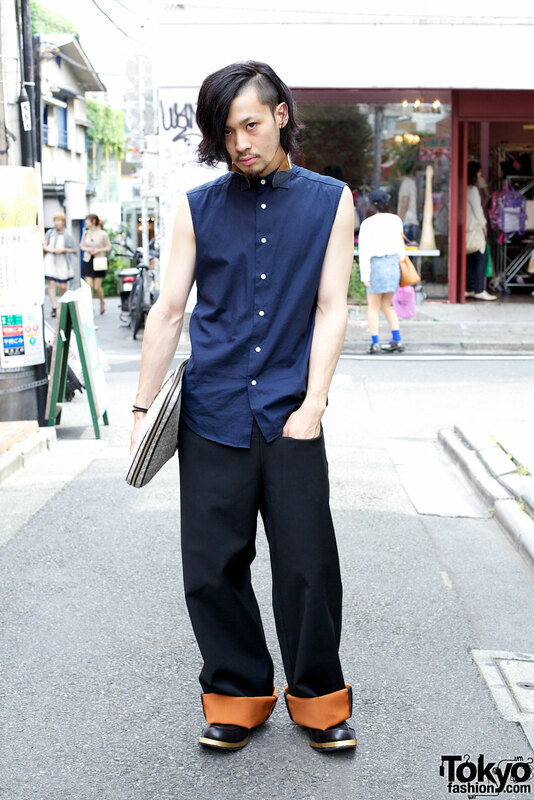 Cool guy with asymmetrical hair in Raf Simons shirt with back zipper and metal collar. Friendly girls in white outfits from WEGO and Wonder Rocket with pink shoes and lace socks.